Indian fashion stores are plentiful on 74th St and 37th Avenue in Jackson Heights. 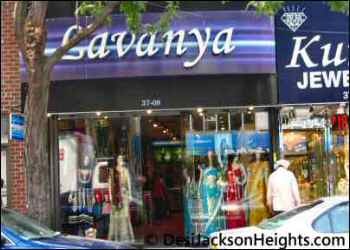 India Sari Palace, Lavanya and Zahra are some of the prominent Indian fashion clothing stores in Jackson Heights. On display are a range of items like Sarees, Churidhars, Ghagra cholis, Kurti, Indian Tunics, Lehanga, Salwar Kameez, Jodhpuri Sherwani, Indo-western Dresses, Kanjeewaram Sarees, Bridal Lehanga, Binny Silks, Chanya Choli and Dulhan attire. Besides the latest in Indian clothing, many fashion stores in Jackson Heights NYC offer related products like bangles, necklaces, toe rings and costume jewelry. Often, weekends are the most hectic time for the Jackson Heights fashion stores. You can see Punjabi, Gujarati and Bengali women alight from their Jaguar, Lexus, Infiniti and BMW cars and SUVs to throng the Jackson Heights fashion stores looking for glitzy attire for parties, weddings, Diwali, Sankranti, Ugadi, Dassehra, Christmas, Ramadan and other festive occasions.